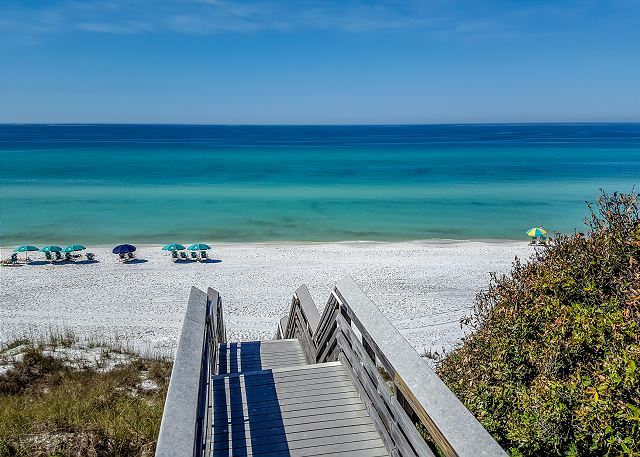 Welcome to Seagrove Beach, Florida. This one bedroom, second-floor condo at Rollin Tide Villas has a beautiful view of the heated pool and sculptured landscaping. It is just a short walk to the beach with very convenient access. This adorable condo provides comfort and privacy for all guests. We have a great full kitchen, the living room includes a flat-screen TV, and we offer WIFI. The condo sleeps two to four including a queen-size bed and a queen size pull-out. This unit is pet-friendly for small dogs. Please let us know if you're bringing your furry friend - $75.00 pet fee applies. This condo is located in a quiet neighborhood that is ideal for children and adults to walk, play or ride bikes in a very beautiful and safe environment. You can step out your door and enjoy sunbathing, swimming, surfing, sand castle building, etc. Also outside your door you may wish to walk or bike using the paved bikeways to nearby FAMOUS SEASIDE VILLAGE (one and a half miles) or other nearby attractions. In addition, there are FREE outdoor concerts, wine festivals, unique art festivals, live theater, outdoor family movies, art galleries, arts and craft shows, antique car shows, and good old hometown parades. 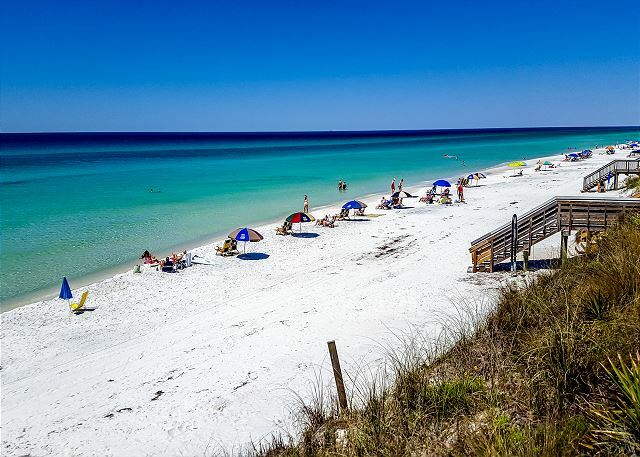 On top of that, we are known for fishing, dining, golfing, tennis, boating, skiing, and unique local shopping or the huge outlet mall in Sandestin (20 minutes away). It is absolutely one of the most wonderful and relaxing places in the world. If you desire a little more strenuous activity, jump in the car and take a short ride to Panama City or Destin for the theme parks, water parks and other attractions. In other words, whatever your interests and desires are, everything for your best vacation ever is right here! Perfect for myself and my dog. Benchmark was very attentive to any issues. We enjoyed our stay at Gentle Tides. The condo was roomier and nicer than the pictures showed. It was a short walk to the beach access. The place was clean and with well stocked kitchen. Appreciated that there were extra pillows, beach chairs, and even salt & pepper & olive oil for cooking our Goat Feathers' shrimp and crab cakes. My family and I usually visit the area every year or every other year. This was our first time staying here and it was great. We had a wonderful visit. My kids had a blast and so did the dog. It was great to have a quiet place to unwind right on the beach. Great for pets and people! Gentle Tides is a comfortable gem for families and pets. The well maintained grassy areas and trash receptacles were well placed for pet owners. The pool area is lovely, well maintained and perfect for sunbathing then taking a refreshing dip. The property is located between two public beach access points and across heavily trafficked 30A. As older folks we opted to use the nice pool rather than make the trek to the ocean. The unit was clean, well maintained and has comfortable furniture. The washer and dryer were appreciated and necessary to have enough towels for the week. A bath mat is needed when stepping out of the shower/bath. Hotel sized soap, shampoo, conditioner were there but no extra toilet paper! We had a great week at Gentle Tides! Thank you for submitting your review - all comments and suggestions are greatly appreciated! So glad you and your furry family member enjoyed Gentle Tide! It is a gem for sure - everything you might need in one little comfy, cozy package! We do realize that 30A can be busy at times so we do ask everyone to use caution when crossing! Luckily it's just a quick walk right over to the beach! We also just wanted to make sure that all of our future guests understand that we do provide a starter set of amenities such as toilet paper, paper towels, shampoo, conditioner, body wash, soap and lotion as well as dishsoap and pods for laundry and the dishwasher but these may not last for your entire stay so if you have any questions about what to bring please just let us know! What we thought was going to be a nightmare with a storm boring down, turned into a wonderful week in 30A. The gentile tide condo was perfectly accommodating and minutes walk to the beach. The pool was a wonderful break from the sand and the kids absolutely loved it. We were in a perfect location with great dining, a Publix for groceries, and only 20 miles from Destin and shopping. Thank you for taking the time to submit your review! 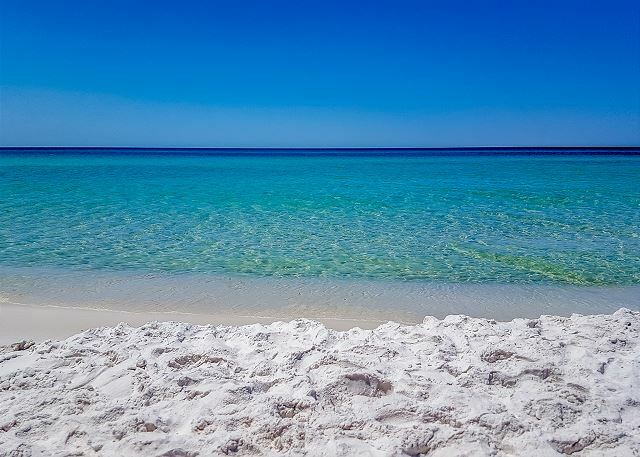 Gentle Tide is right in the heart of Seagrove Beach! Within a few minutes of the majestic Gulf of Mexico it is hard to beat the location! For your time away from the beach you can enjoy the fun community pool or head either direction for some boutique shopping! Whether or care to dine out or dine in you are covered - several restaurants within walking distance and a fresh seafood market just a bit down the road! Come stay with us at Gentle Tide - call Benchmark today! Thank you for taking the time to submit your review! We will address the bedding issue that you have brought to our attention and see what changes we can make! We do agree that this is a great condo in a wonderful location! We do hope you will come join us at 30A and enjoy the beach experience! The condo itself was as described and clean. Kitchen was very well stocked with plenty of cooking equipment and utensils to make meals. It was very helpful to have use of beach chairs and umbrella so we didnt have to bring them from home. The complex itself is a little older, but it was fine. The unit was a 5 to 10 minute walk from the beach, cutting through an area that is now under construction and soon may be blocked off as a public pass thru. However, there is another public beach entrance thats not far away and probably would be more like a 10 to 12 minute walk from the unit. The property management company neglected to tell us what unit we were in, although we were given the address of the property. I had to call them to find out what unit we were in and it was after hours. To their credit, I got a phone call back within 5 to 10 minutes and we were able to find the unit. Wouldve preferred knowing the unit number before we arrived. Thank you for submitting your review - we do appreciate your comments and suggestions! We again apologize for the incomplete information - sometimes dealing with new software can be difficult! Fortunately we have been able to correct the issue so that all of our properties are correctly identified with unit numbers and we will not have this issue again! We are glad you enjoyed your stay in Gentle Tides - this is such a cozy condo with everything you will need to have a relaxing beach vacation! We do hope you will join us again soon! A quick get away for my husband, golden, and me. Great time and ended up being pretty good weather despite predicted bad weather from hurricane Nate. Condo was clean and cozy with everything we needed. Neighbors were friendly and proximity of stores and restaurants is excellent. Thank you for submitting your review - we are so very glad that you enjoyed your stay here with us and also glad that your furry family member could join as well! It is great to find a property that will allow our family dogs to be a part of the vacation! We do hope that you will join us again soon! Thank you for submitting your review! Glad you enjoyed your stay and we wish we would have know about the areas that were too wet - we could have contacted the Condo Association to see if they could leave the sprinklers off for a couple of days so it could have dried for you! We do hope you will join us again soon!